“They were moved because they were few in number and not white,” Vine added. The U.S. government circulated the fiction the Chagossians were transient contract workers that had taken up residence only recently but, in fact, they had been living on Diego Garcia since about the time of the American Revolution. Merchants had imported them to work on the coconut and copra plantations. Vine said the U.S. government induced The Washington Post not to break a story spelling out events on the island. 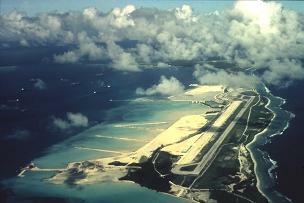 Although the Chagossians were forcibly removed in 1971, they still hope to return, Vine says, and refer to their period of exile as one of “profound sorrow.” Vine says they would be happy to live on the unused eastern portion of the island and work at the base but the U.S. instead “imports contract labor from other areas so they can send them home when the job is done.” The island’s exiled survivors and their descendants today number about 5,000. Long off limits to reporters, the Red Cross, and all other international observers and far more secretive than Guantánamo Bay, many long suspected the island was a clandestine CIA “black site” for high-profile detainees, Vine wrote in a related article. Journalist Stephen Grey’s 2006 book “Ghost Plane” documented the presence on the island of a CIA-chartered plane used for rendition flights. On two occasions former U.S. Army General Barry McCaffrey publicly named Diego Garcia as a detention facility. And a Council of Europe report named the atoll, along with those in Poland and Romania, as a secret prison. Diego Garcia had been a British possession until 1966, when London allowed the U.S. to use it as a military base in exchange for cancelling a $14-million British debt for a military hardware purchase. Some idea of the size of the base may be conveyed by the fact it is said by the Pentagon to contain 654 buildings.